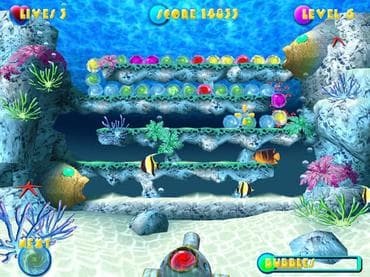 The object of AquaPOP is to eliminate all the balls rolling onscreen before they reach the fish mouth. When a ball reaches the fish mouth, you will lose one of your lives, and when all your lives are gone, it's game over! When there is a group of 3 or more balls of the same color touching, they explode! Practice your aim to make sets quickly and efficiently in this free full version game! Game Features: - Family friendly game; - Stunning 3D graphics; - Perfectly tuned gameplay; - Load/save game option; - Game statistics; - Free full version game without any limitations. If you have questions about Aqua Pop game, please contact us using this form.